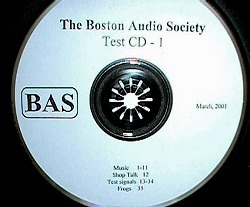 The Boston Audio Society Test CD-1 contains 71 minutes of contributions by members. Soli Deo Gloria (the group's new name is New World Chorale), Holly Krafka conducting. This piece was written as an exercise in counterpoint; it is built as a double canon* (soprano/tenor, alto/bass) at the interval of a ninth below (which would be very dissonant if the musical lines occurred simultaneously). Having set himself this formidable challenge, Brahms creates a remarkably expressive piece whose text begins "Lass dich nur nichts nicht dauern mit Trauern" ("Let nothing afflict thee with grief"), dedicated to Clara Schumann after her husband Robert was confined to an asylum. (The introduction quotes from Robert Schumann's Fourth Symphony, which he had dedicated to Clara.) The final "Amen" abandons the canon and unfolds over a held low E-flat from the organ. *A canon is a composition or passage where the melody is repeated by one or more voices, overlapping in time in the same or a related key. This track is recorded in Logic 7, Lexicon's seven-channel encoding system. The primary goal of Logic 7 is to mix down five channels into two such that the energy (loudness) of each track in the original is preserved in the two channel mix, and at the same time give the tracks an identifiable phase relationship so they can be reassigned to their original spatial position with a Logic 7 decoder. The major consequence of this goal is that a five-channel recording can be played on ordinary two-channel equipment and retain the instrumental balances in the original. Thus the Logic 7-encoded recording is compatible with two-channel stereo equipment. 11. Verdi: Requiem: Dies Irae, Mors stupebit. We could not issue this CD without a recording by our late founder, Peter Mitchell. This work is one of the hardest to record with natural dynamic range. The original was captured on videotape using a PCM-1, an early 14-bit Sony professional encoder. Fearing that the quiet passages would be lost in the dithering noise of the processor, we had Rene Jaeger build a custom dbx I encoder with a mild 1.5:1 companding ratio. This type of signal processing actually works better with digital encoding than with analog, since digital is extremely consistent in frequency response and signal levels, eliminating the most common sources of decoding errors. The recording was later decoded and transferred to a 16-bit PCM-F1. 12. "Shop Talk", WHRB-FM, November 5, 1984. Peter Mitchell (on the left), Richard Goldwater, MD (center) and E. Brad Meyer (right) introduce the show with a 1932 stereo recording and prepare to talk with guests Mark Davis and David Moran, both then of dbx corporation. Track 21 is borrowed with permission from Tomlinson Holman's Hollywood Edge test CDs, where it is billed as a high-frequency limit test for your system. It is of course no such thing, as Holman admits with little prodding; modern tweeters all go out to 20 kHz or beyond, but aging listeners do not. Holman's test is a tone that starts at 8 kHz and sweeps upward. You track the sound, starting at 8 kHz and reading the index points that occur every 0.5 kHz, noting when the tone seems to disappear. The test works, but it requires the listener to say when he or she stops hearing sound  which is more difficult than the opposite, so we reversed the signal and put our version first, on track 20. Our tone begins at 20 kHz, and you can find out how badly you've treated your hearing over the years by reading the numberof seconds from the beginning of the track at which the tone becomes audible and consulting the table below. A short sound selection, such as you might hear in a concert, repeated 5 times at successively decremented 10 dB levels. It was made by playing the original recording through passive attenuation into the Sony SBM-1 Super Mapper (A/D converter). The Sony uses noise shaping to lower the audible noise in the 3 kHz region at the expense of extra noise at 20 kHz, resulting in a 6 dB improvement over standard 16 bit PCM (by my measurements). The last track represents the quietest a CD can be. Play the loudest music on this CD at the highest level you can stand and then compare track 32 to your ambient noise. In the unlikely event you can hear the track noise, then you need more than 16 bits of dynamic range (with proper dithering, distortion drops at low levels, just like analog, in all bit formats). Frequencies with a "T" have a brief tone before the start. Note: If your player displays index marks subtract one from the mark at which the tone becomes audible and read the frequency from the table. add 1 to the seconds display and look up the result in the table.